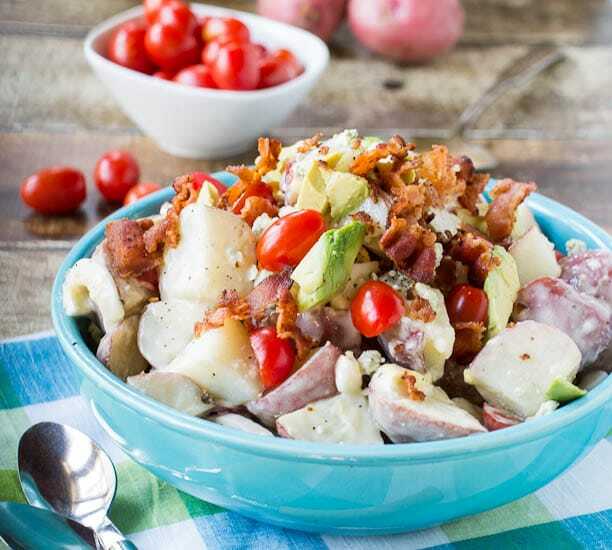 If you love cobb salad, this potato salad is a must try. It is full of blue cheese, avocado, hard-boiled eggs, and bacon. A mixture of Italian Vinaigrette and Blue Cheese dressing really gives the potatoes some zing. I like to toss the warm potatoes with half the mixture of dressing and let it marinate together for a while. The potatoes will really soak up the dressing and be nicely flavored by it. Then, just before serving, add the rest of the dressing and the potatoes will have a creamy coating. 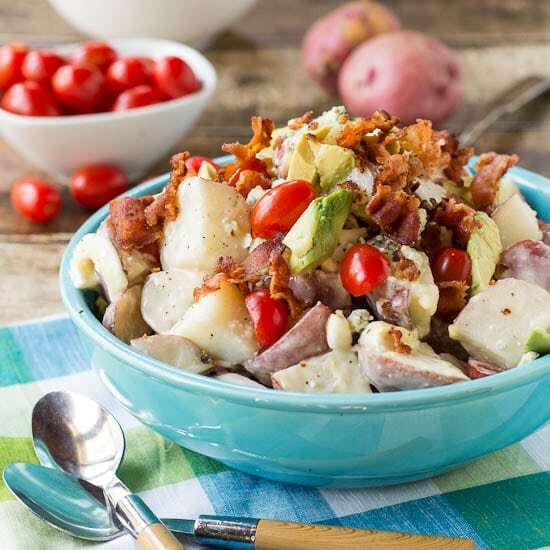 I really wanted to use my daughter’s favorite dressing (Marie Calender’s Blue Cheese Vinaigrette) for this Cobb Potato Salad, but I couldn’t find any at the store. She first had it about 2 1/2 years ago at her grandmother’s house in Virginia. Up until that point, she didn’t like a single salad dressing. Not one. For a salad she would eat plain lettuce. As soon as we got home, I rushed to the store to get this wonderful salad dressing that made my beyond picky daughter want to eat salad. I didn’t find it at my regular store so I went to another. And another. No luck anywhere. Each store had multiple Marie Calender dressings, but not the Blue Cheese Vinaigrette. I could not give up. I went to the Marie Calender website and emailed them asking where I could find it in my area. No response. About a month later, I stopped at Food Lion (which is actually the closest store to my house, but I never shop there unless I only need 1 or 2 things and I need them fast) and lo and behold, there it was. At the store where I’m least likely to find what I’m looking for. Go figure. Well, anyways. Back to the Cobb Salad. I swung by Food Lion last week to pick up a new bottle for this potato salad, and there was none to be found. The produce man eyed me frantically reading the bottles of Marie Calender dressing, hoping that my eyes were just playing tricks on me. He insisted on checking in the back for some even though I knew his efforts would be futile- I’d read all the tags and there wasn’t one that said “Blue Cheese Vinaigrette”. When he came back and let me know he couldn’t find any, he suggested I make my own by combining Italian dressing with Blue cheese dressing. Why yes! That would work. At least for this potato salad. It still wouldn’t work well as a salad dressing, because there is no other salad dressing on this earth that tastes like Marie Calender’s Blue Cheese Vinaigrette. It’s got that perfect balance of chunks of blue cheese, with a little tang, but also some sweetness. At least it is still listed on their website, so I don’t think it has been discontinued. Have you ever had one of your favorite go to foods vanish from the grocery store shelf? 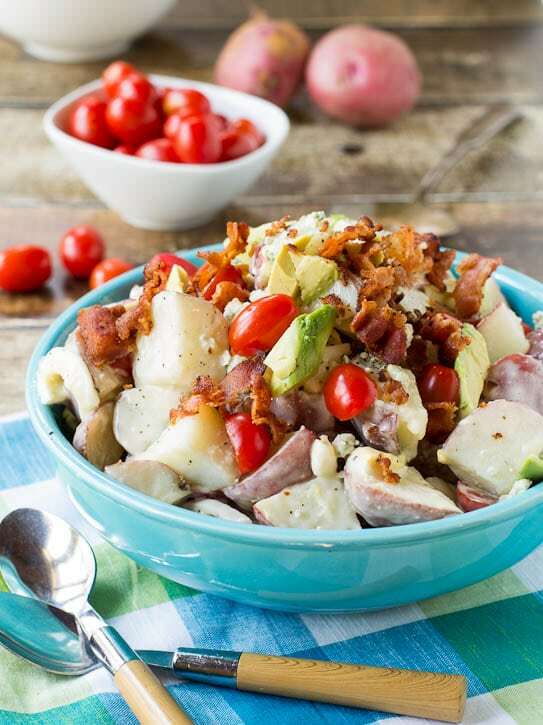 Potato Salad with bacon, hard-boiled eggs, avocado, and blue cheese. Place potatoes in a medium saucepan with water to cover. Bring to a boil and simmer until potatoes are tender, about 12-15 minutes. In a small bowl whisk together vinaigrette, blue cheese dressing, and sugar. Pour half on top of potatoes and mix well. Cover potatoes with plastic wrap and refrigerate 1-4 hours. Refrigerate remaining vinaigrette mixture as well. Just before serving, stir remaining vinaigrette mixture into potatoes. Taste for seasoning and add additional salt if necessary. This entry was posted in Salads, Side Dishes and tagged blue cheese, cobb salad, potato salad, potatoes. Bookmark the permalink. Time for you and your daughter to get together and recreate that Blue Cheese Vinagrette so you won’t be in a frenzied shopping panic rushing around trying to find that bottle of dressing. By including her in the creative process and tastings you might open her up to new possibilities. Then try including her when you create other dishes. Children love to experiment. Cooking is a process of experimentation. I love Pasta Salads, they are my go to meal in the Summer HHH,90+ days. Also on Face Book and Pinterest. Thanks Kelly! I hope so too! Now this looks like my kind of potato salad! I love a good cobb salad!! Love love love this twist! Potato salad can be so so boring, but this totally spices things up. Yes, potato salad is one food that often tastes kind of blah to me. Hope you are having a good week Nicole! Wow! That is certainly a salad I could fall in love with. 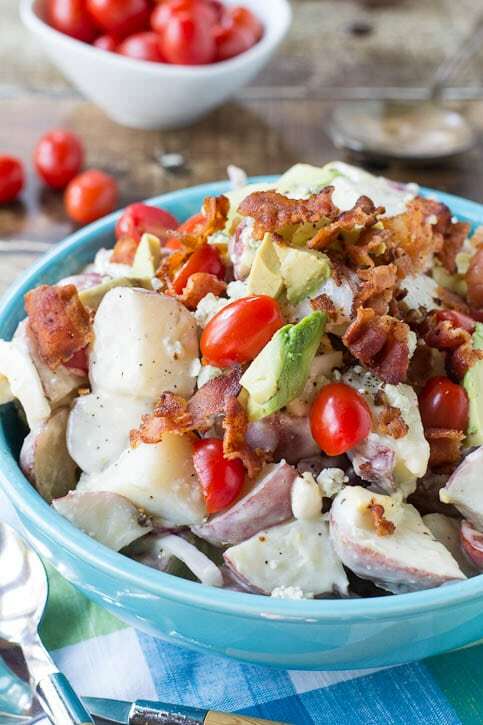 I agree with the above comments about how great an idea it is to combine to favorite, classic salads together – potato and the cobb. Thanks for sharing this delicious looking recipe! Love cob salads…love the flavor combinations!! For one – this salad is just GORGEOUS! And – why have I never thought of combining potatoes and avocado??? So yum! What a great idea to combine two of my favorite salads…your salad really sounds great. I know what you mean when a favorite ingredient/staple goes missing from the grocery store. In my case, when I moved to the West Coast from the Midwest, I couldn’t find Chocolate Malt-O-Meal, the hot breakfast cereal. My family has to ship it to me every few months. Good luck finding your vinaigrette! Wow – this looks amazing Christin! 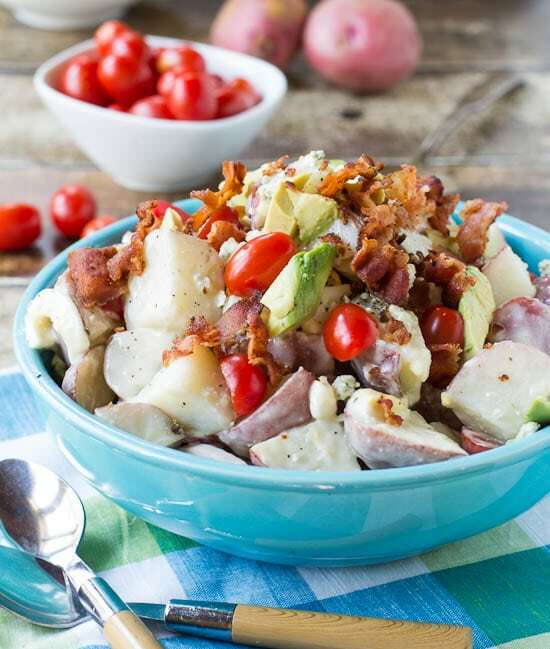 I love Cobb Salad AND Potato Salad – so putting the two together is just brilliant! Pinned! This is so vibrant and pretty! 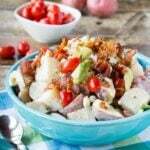 I love Cobb salad, and I can imagine it must be even better when combined with potato salad. Good luck finding your daughter’s favorite Blue Cheese Vinaigrette. It sounds like it’s worth searching for!